As Francisco Mejia's historic streak came to an end Sunday, Bobby Bradley extended one of his own. 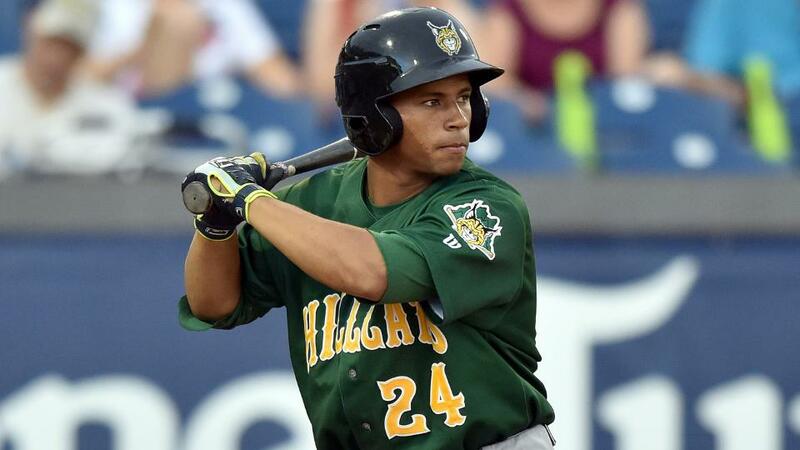 Mejia, the fourth-ranked Indians prospect, hit in 50 straight games before going 0-for-3 with a walk and an RBI, No. 3 Bradley belted a home run in his third straight game to help Class A Advanced Lynchburg blank Winston-Salem, 6-0, at Calvin Falwell Field. A day after a controversial scoring change enabled Mejia to tie for the fourth-longest run in Minor League history, the 20-year-old catcher came up empty in four plate appearances. He drew a walk in the first inning, plated a run with a groundout in the third, popped out to second in the fifth and was robbed on a line drive caught by a diving Michael Suiter in right-center field in the seventh. Bradley, meanwhile, padded his Carolina League lead in home runs with his 25th of the season in the third inning. He sent a ball over the center-field wall on the seventh pitch of his at-bat against Dash starter Zach Thompson, the No. 23 White Sox prospect. The 20-year-old first baseman, who led the Midwest League with 27 long balls last season, is four ahead of Frederick's Aderlin Rodriguez with 20 games remaining on Lynchburg's regular-season schedule. The home run was Bradley's fifth in 10 games and he sports a modest six-game hitting streak during which he's batted .409. As for Mejia, Sunday marked his first game without a hit since May 25, a stretch that included 24 games with Class A Lake County prior to his promotion on June 27. "I'm just happy for the kid," Captains manager Tony Mansolino said Saturday. "He's young, he didn't have the best year last year in a couple of different ways. This year, he's completey changed himself in several different ways. To see him go out and get on a run like this, part of it is the result of some of those changes, part of it is a result of just how talented the kid is. "To see him have the success right now, you see him on social media, you see him on SportsCenter, you see him on MLB, that's some pretty cool stuff for anybody, whether you're a big league All-Star or you're an A-ball All-Star. So to see him kind of get that notoriety, I'm happy for the kid." The 50-game hitting streak marked the most for a catcher in Minor League history, topping the one set by Mobile's Harry Chozen in the Southern League in 1954 by one game. "It has not been easy for him," Indians director of player development Carter Hawkins told the Associated Press. "This has not been put on a silver platter. He's moved levels, he's traveled around to different All-Star Games, he's been a name that came up in trade rumors. There have certainly been a lot of different reasons or potential excuses to end this streak, but I think just focusing on his work and focusing on what he can do and what he can control has really helped him out. "He's still in A-Ball, he's still extremely young, he's still learning a lot of things about the baseball game," he added. "If he continues to improve, if he continues to have the consistent approach at the plate, if he continues to improve behind the dish and manage a pitching staff, we absolutely see him as a guy that can help us out in the Major Leagues down the line." Also contributing for the Hillcats on Sunday were Indians' No. 19 prospect Tyler Krieger, who tallied three hits, and Claudio Bautista, who lofted a two-run homer. Lynchburg's Matt Esparza (1-2) yielded five hits and a walk while striking out six over 5 2/3 scoreless innings.